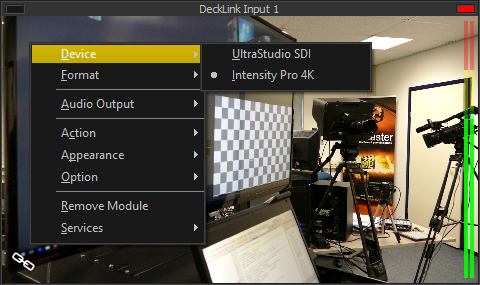 The DeckLink Input module is used to ingest a video stream from a Blackmagic DeckLink video capture device directly, bypassing* its DirectShow driver. Due to their software processing* DeckLink cards are more prone to frame dropping, so an additional Phase Locked Loop with buffering is added to keep the stream and buffer size (and so latency) constant. *Blackmagic DeckLink cards are designed quite differently from other brands in that most processing is done in software. The advantage is lower production cost. The disadvantages are higher CPU and memory usage, higher latency, higher bandwidth requirements for the motherboard and a higher chance of instability when the system cannot cope. In addition the DirectShow drivers are poorly supported and at times unstable. Despite these disadvantages the cards remain very popular due to their availability and low price. A list of all DeckLink devices available. DeckLink devices are extremely picky and will only work if you select the exact same signal format as applied to the device. Colour bars will be displayed if you select a format that is supported but that does not correspond to the applied video signal (or if there's no video signal at all). Note the proper input may need to be selected (once) first in Blackmagic's Desktop Video Setup utility.